The radiator is an integral part of a vehicle cooling system. Unless the engine is air-cooled, all motor vehicles have a cooling system. The radiator is a heat exchanger used for cooling the engine. Engine heat is transferred into a coolant that is circulated around the cooling system to the radiator. When the coolant reaches the radiator, air flow across the radiator absorbs the rest of the heat from the coolant, preparing the coolant to recirculate through the cooling system and absorb more heat, thus continuing the cooling cycle. Radiator design has improved over time with better materials and and manufacturing processeses leading to longer life spans and lighter, more efficient cooling systems. The radiator is the heat exchanger that cools the engine coolant. Coolant enters the inlet tank via a rubber hose from the radiator. Coolant collects at the outer tank of the radiator, then passes back to engine via a rubber hose.Cars with automatic transmissions usually have an oil cooler in the outlet tank. Pumps the coolant through the cooling system. Ensures air flow to the radiator even when the vehicle is stationary. Coolant is a specific mixture of chemical additives and demineralised water used to prevent corrosion in the cooling system, increase the boiling point and prevent freezing. Manufactured coolant must be used in your radiator. A plastic container that contains extra coolant for the radiator and provides a place for overflow to pass to, while still remaining in the system.Extra coolant should be added here when required. Assists the engine to quickly reach and maintain the proper temperature by shutting when the coolant is cold, allowing it to heat up inside the engine first. The radiator pressure cap sits at the top of the radiator or overflow reservoir and has two valves—a pressure valve and vacuum valve.It allows the system to operate under pressure, which increases the coolant boiling temperature. The radiator cap should never be opened when hot. For radiator repair and air conditioning services in Christchurch and around NZ, call us today. *This guideline to how radiators work has been put together based on information provided by our trusted supplier Denso. We hope you find it useful. Diagnose your radiator and get radiator repair andparts in Auckland and across NZ. Radiator contamination is when foreign matter gets inside the radiator due to a blockage, insufficient coolant levels, or poor preparation when fitting a new radiator. Radiator contamination is caused by insufficient flushing of the engine cooling system (engine block, heater system and overflow bottle) prior to fitting a new radiator, and by inadequate levels of fluid in the system for prolonged periods, such as when a vehicle is left sitting without being driven. It can also be caused by inadequate preparation prior to installing the radiator that allows foreign bodies such as other fluids inside the engine cooling system to interfere with the performance of the coolant. Contamination slows the flow of coolant around the cooling system, resulting in blockages in the radiator, header plate and tank and reducing cooling efficiencies and performance.If left, critical radiator components can deteriorate and fail, overheating and seizing the engine. Prevent contamination by servicing the radiator and cooling system regularly using the manufacturer's recommended coolant, and adequately flushing the coolant system during the coolant change to clean the system.Check for coolant system leaks, cracks in the radiator and bad hoses. As your radiator and air conditioning servicesdistributor in Auckland and across New Zealand, A1 are radiator repair experts.If you've got a contamination problem give us a call today. *This guideline to radiator contaminationhas been put together based on information provided by our trusted supplier Denso. We hope you find it useful. Identify and prevent corrosion with New Zealand’s number oneradiator repairdistributors. Radiator repair is most commonly required to fix internal corrosion, a mechanical and chemical deterioration of the radiator's tubes and header plates that leads to holes and cracks in the radiator core. Corrosion is generally caused by not changing the coolant regularly enough.Coolant that is too old can turn acidic and eat away at the engine from the inside out. Leaving old coolant residue in the cooling system by not completely flushing it out when fitting a new radiator can also cause corrosion.Always ensure the engine block, heater system and overflow bottle are fully flushed to prevent a radiator repair in the future. Mixing of different coolants, or contamination via an additive, can also cause radiator corrosion that will require radiator repair. The tubes of a corroded radiatorare covered in white residue and become weak and brittle, eventually developing holes and cracks through which coolant can escape.This leaves the radiator unable to effectively perform cooling, leading to overheating of the engine. Solder bloom is a type of internal corrosion that forms when neglected coolant, rust and certain additives react with the soldered joints in a copper/brass radiator. Crumbly white and green deposits begin to grow, which can block tubes and restrict the flow of coolant. If your radiator has solder bloom a radiator repair will include recoring or replacing the radiator and flushing the system to remove deposits and sediment. Prevent corrosion with regular servicing of your cooling system using the manufacturer's recommended coolant.Ensure adequate flushing of the cooling system during the coolant change, and top up your cooling system with the same pre-mix in between coolant changes. A1 are yourradiator repairdistributors for Hamilton, Auckland and across the country.If you need to replace a corroded radiator,give us a call today. *This guideline to corrosionhas been put together based on information provided by our trusted supplier Denso. We hope you find it useful. Advice and radiator repairing in Christchurch and around NZ for stray current corrosion. Electrolysis, also called stray current corrosion, is a systematic removal of the protective layer on the inside of the radiator tubes due to improper grounding.Electrolysis requires radiator repair by a reputable workshop. Electrolysis is a chemical reaction that takes place between the coolant and metal surfaces on many late model vehicles that have aluminum heater cores and radiators. Worn out coolant or engine ground straps that are damaged, loose or missing will allow stray electrical currents to flow through the coolant and react with the aluminium, eating away at the heater core, radiator and other aluminium parts. Vehicle collision damage is another cause of poorly grounded electrical components. Sometimes stray electrical currents can find their way into the cooling system if aftermarket electrical accessories such as a stereo, CD player, lights, etc. are not properly grounded to the chassis.Existing stray current problems can also go undiagnosed when fitting a new radiator so make sure any radiator repair or installation of new components is performed by a reputable workshop. Systematic removal of the corrosion protection layer on the inside of the radiator's tubes typically results in multiple holes. You may notice a build-up of white aluminium oxide powder blocking passages, or visible through the inlet and outlet pipes, and a blackening of the fins and header plate. All of these indicate you need a radiator repair. Prevent electrolysis by testing for stray current in the cooling system with a digital voltmeter and look for a reading of zero. Check the engine ground straps and make sure they are tight and in good condition with good electrical contact. Also check any ground straps on the alternator, and the battery cables (both ends). If you discover any poor electrical grounding, particularly after installation of aftermarket accessories or radiator repair, just call your local Christchurch radiator repair experts at A1. We'll sort you out! *This guideline to electrolysis has been put together based on information provided by our trusted supplier Denso. We hope you find it useful. Prevent thermal shock with yourradiator repair distributors across Tauranga and NZ. Thermal shock/stress is caused by drastic differences in temperature that cause tubes to flex and fail. Differences in coolant temperature and pressure cause surges that slam coolant against the inlet side of the radiator, damaging the radiator tubes and requiring radiator repair. Thermal shock will cause the radiator tubes to fail due to fatigue, and leak coolant into the core plate near the inlet pipe.The leak will start as a slow seepage and deteriorate further over time until radiator repair is necessary. Some models may be repaired by installing a thermostat with a bleed hole. This will reduce thermal fluctuations by softening thermostat influence. If this radiator repair is not effective for your vehicle, consult your radiator repair shop for a replacement radiator. Always use radiator originally designed for your vehicle, and perform regular maintenance of your radiator and coolant by servicing your cooling system every year or 10,000km. Maintenance of coolant is very important to prevent thermal shock, as any corrosion to the tube wall will accelerate tube fatigue. Give A1 Automotive Cooling a call today to help with all your Radiator and Air Conditioning servicing including Tauranga and all around New Zealand. *This guideline to thermal shock has been put together based on information provided by our trusted supplier Denso. We hope you find it useful. Why do I need a radiator cap? Damaged radiator cap? Call A1 Automotive Cooling, the number one radiator and automotive cooling specialist and distributor in Auckland and across New Zealand. The radiator cap keeps the coolant level in the radiator at the desired amount.The cap releases coolant to the overflow bottle at a certain pressure, then draws it back as the engine cools to maintain the correct coolant levels in the radiator. A weak radiator cap (or the wrong one for the application) can allow excessive amounts of coolant to escape into the overflow reservoir when the engine gets hot, then prevent it from being siphoned back into the radiator as the engine cools, leading to a low coolant level. Always pressure-test the radiator cap to make sure it holds pressure and meets the specifications for the application it is being used for. Radiator cap failure results in coolant leaking from the radiator and an inability to maintain pressure in the cooling system, or alternatively, over-pressure caused by fluid not being forced over the flow bottle. The radiator cap is vital to maintaining your radiator and preventing the need for radiator repair. A pressure test can be performed on your radiator cap to ensure it is working properly. When checking the coolant regularly, also check the radiator cap for worn or cracked rubber gaskets. If the cap does not seal properly, fluid will be lost and the engine will overheat. Need a new radiator cap or radiator assistance? Call the number one radiator repair specialist and also radiator distributor in Auckland—give A1 Automotive Cooling a call today. *This guideline to radiator caps has been put together based on information provided by our trusted supplier Denso. We hope you find it useful. How do I maintain my radiator? Maintenance and radiator repair advice, parts and distribution to Hamilton and across New Zealand. Radiator and cooling system maintenance is essential to prolong the life and efficiency of your engine. As much as 70% of the car's main source of power, petrol, is converted to heat which must then be converted to air for the combustible engine to operate. The radiator is one of the hardest working components of your vehicle, and should be kept running smoothly with regular radiator checks, maintenance and servicing. A radiator should be serviced regularly after 135,000kms, always using the coolant recommended by the manufacturer. For radiator repair always visit a reputable radiator repair workshop. At home, you can perform the following health-check on your radiator to detect problems before you need a full radiator repair or replacement. 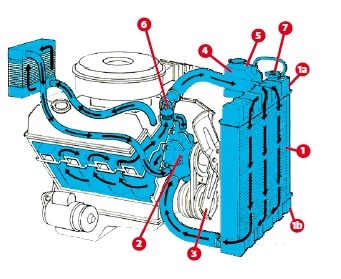 Ensure you know the correct ratio of coolant to water to prevent damage to the water pump. Keep coolant at the correct level.Consult your owners manual or the manufacturer for the correct coolant level for your vehicle model. Check that the radiator tubes are clear and the brazing appears to be good. Look and listen for any obvious leaks. Check for visual signs of corrosion on the header plate. Ensure there are no signs of abnormal residue or foreign materials in the tank. Ensure there are no visual signs of corrosion on the oil cooler. Cold spots on the radiator after it has been warm indicate there is probably a blockage. As the Automotive Cooling Specialists give A1 Automotive Cooling a call today even if you are from Christchurch to Hamilton, we've got all your radiator repair components covered. *This guideline to radiator maintenance has been put together based on information provided by our trusted supplier Denso. We hope you find it useful. Why does my radiator have two small pipes at the bottom that are not connected? Will these leak coolant out? These two small pipes are for the Auto Transmission Cooler, which are only used in Auto Transmission cars. If your car is Manual Transmission then these will be unused. This Transmission Cooler is a sealed system so will not leak any Coolant. An Automatic radiator can safely be fitted to a Manual Transmission and in most cases is the only option available.